Your skin is the largest organ of your body, so it is exposed to many microbes and elements. To make sure it continues to do its job in guarding us from any harmful agents, I cleanse, treat, hydrate, and protect my skin every day. My skincare routine is different in the summer. Products will melt off my face in the heat, and I am very prone to sweating, so less is more. 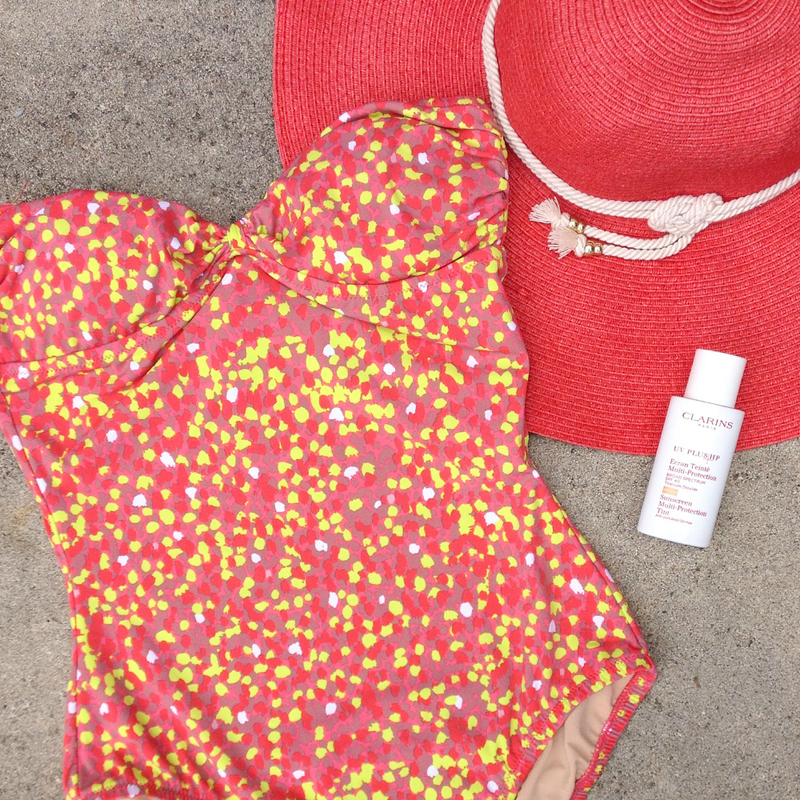 I'll "Give You the Skinny" on the key products I use in the warmer months! 1. Fresh Soy Face Cleanser - This soap-free and fragrance-free cleanser gently washes the face, so it is great for all skin types. Soy proteins aid in cell turnover and help to retain the skin's moisture, so your skin won't get irritated or feel dry. Perfect for those with sensitive skin! Rosewater helps to tone and balance the skin. That delicious smell is from a cucumber extract, which helps to calm the skin. Although this cleanser takes off makeup, I use Aveeno Ultra Calming Makeup Removing Wipes to take off all of my makeup, including my eye makeup before I cleanse. It doesn't make my face red and takes off everything! 2. Clarisonic PLUS - Paul got me this waterproof cleansing brush for my birthday three years ago, and I can attest that this is THE skincare product I can't live without. I apply the Soy Face Cleanser to my wet skin and use the wet brush to get a thorough cleanse. This brush uses sonic frequency that has the "power to remove 30x more pollutants than manual cleansing". So amazing! My skin is brighter and smooth, and my pores appear smaller. Yay!! 3. Ole Henrikson Truth Serum Vitamin C Collagen Booster - Next step is to treat. I apply this serum in the A.M., because it also protects! This serum contains vitamin C, which is an antioxidant that fights free radicals that can cause premature aging and harm to the body's cells. This vitamin C complex contains different fruit extracts that also help with brightening and tightening. This line is free of parabens, sulfates, and phthalates that can irritate your skin or may cause cancer. 4. Origins GinZing Refreshing Eye Cream - Now, one must hydrate twice a day. Origins is another line that is free of parabens, sulfates, and phthalates. Our bodies are comprised of approximately 70% water, so it is important to drink at least 64 oz. of water each day. Our skin needs moisture too, so this will help to retain water on the skin and to prevent drying and fine lines. An instant eye brightener. It helps to depuff and reduce dark circles. Good morning! 5. Origins GinZing Energy Boosting Moisturizer - This oil-free facial moisturizer dries matte and is very lightweight. It provides just the amount of hydration you need for the hot summer days. This also contains ginseng and coffee bean to boost hydration and energy levels! 6. Clarins UV Plus HP SPF 40 Tint in Medium - Lastly, protect! I have raved about this non-greasy sunscreen with safe-for-you 100% mineral filters to block UVA(ging) and UVB(urning) rays. I love how natural it looks and lightweight it feels. It has a patented anti-pollution complex and fights free radicals and DNA damage that can cause premature aging with cantaloupe too! Score! 7. Stila Sheer Color Tinted Moisturizer Oil-Free SPF 20 in Warm - On days I am out in ocean, I apply this tinted moisturizer on top of my treatment, moisturizer, and sunscreen. It evens out the skin and is very lightweight. Noticing a trend? haha! I don't want to feel anything on my face. This product is water-resistant and won't wear off when I am beating the heat in and out of the water! 8. Boscia Smoothing Facial Polish - I use a non-abrasive exfoliator to slough off dead skin cells that can block the skin from absorbing any benefits of the treatment and moisturizer. I do this twice a week to keep my skin looking radiant. Plus, this is half off on www.Boscia.com for only $12.50. It is also important to wear a hat that will cover your face, if you plan to be outside in the sun for a long period of time. I just received this one-piece swimsuit from J.Crew in the mail. I got it during their hot sale event. Love the neon and multi-colored dots! Play it safe in the sun this weekend! I cannot wait to pick blueberries for the first time ever!